An energetic explosion of colorful emotion, Derrival’s debut tells a tale of transcience: Infectious anthems and brooding ballads capture the fragility of certainty and the delicacy of life itself. “The truth is – of course – is that there is no journey: We are arriving and departing all at the same time.” So begins Vancouver band Derrival’s debut, a blistering explosion of colorful pop and rock melodies that speaks to the band’s core: Departure, and arrival. An old quote from David Bowie, the idea that we’re either coming or going – that we’re transients, never quite with both feet on the ground – is a hard one to swallow, at first. It requires a rethinking of how one approaches life, demanding that we treat each day like it might be our last, rather than just a part of our bigger picture. It’s the urgency with which David Bowie lived his life, and the very same urgency Derrival employ in their music. Atwood Magazine is proud to be premiering Derrival, the eponymous debut album for Vancouver-based five-piece Derrival (out 2/16/2018 via AntiFragile Music). Consisting of Adam Mah, Glen Jackson, Dan Kozlowski, Deven Azevedo, and Shane Stephenson, Derrival emerged in the early 2010’s with an energetic guitar pop sound that echoed both bliss and melancholy. Their 2015 Departure & Arrival EP solidified the band’s penchant for big choruses bubbling with enthusiasm – a trait they carry forward into their debut, albeit with more nuance and refinement. 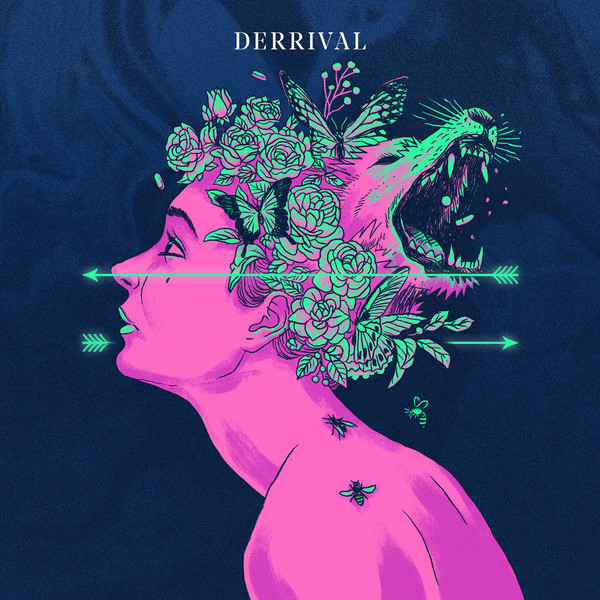 Existing somewhere in the ethereal haze between modern pop and classic rock music, Derrival’s music is both intimately familiar and totally fresh. Their pulsing beats and dance-friendly rhythms lend them similarities to “indie pop” bands like Smallpools, Walk the Moon, Neon Trees and Bad Suns – all good things. Ultimately, however, it’s an vulnerable and honest approach to changing relationships and life transitions that lends Derrival’s music its relatability and comfort. But are we doing it right? Are we doing it right? For better or worse, most debut albums end up offering some sort of overarching statement or motif. Derrival‘s theme is one of transcience: Infectious anthems and brooding ballads capture the fragility of certainty, and the delicacy of love and life itself. Derrival weave a dynamic tale of unclear paths and difficult choices, personal strain and internal pressure. You’ll shout out loud about good times and bad, basking in the magical euphoria of stadium-sized emotional outpourings as Derrival explore what it means to pursue a career in music, celebrity culture, and much more. Experience the full record via our exclusive stream, and peek inside Derrival’s self-titled debut album with Atwood Magazine as the band go track-by-track through the music and lyrics of Derrival! This track is a quote from an old interview that David Bowie did. We’ve never really been able to sum up a concise meaning for our band name because it’s not a real word but a combination of departure and arrival but this really felt like the true meaning of Derrival. His words were “The truth is of course is that there is no journey. We are arriving and departing all at the same time.” Casey Jo-Loos of 102.7 the Peak in Vancouver actually found the quote and showed us. We had a number of people speak the quote on this track including Sarah Jeffery, Tyler Bancroft who plays in an awesome band Said the Whale, Ethan Caleb of Morning Show and a bunch more. This song was about a time that I met one of my heroes, and let’s just say it went poorly. I’ve never subscribed to the whole “Don’t meet your heroes” thing. I think it’s important to meet your heroes because you should be looking up to someone who is a hero through and through, not some idea of them. Ice Cream started from a demo that Shane (Keyboardist) had made and he just named it Ice Cream. After working on it for a while the name just sort of stuck and then I centered the pre-chorus around it lyrically. The song is about the grind you have to do being a musician and the desire to make it your living. This was actually the last track we wrote for the album and we wrote it while we were still recording everything else. We needed a female vocalist to do harmonies on some other tracks on the album and Sarah [Jeffery] was in town after wrapping on Season 2 of Shades of Blue. We had her come do back-up vocals and she absolutely nailed it. I was convinced that we needed to have her featured on a track but we didn’t have anything else written or that made sense to have a feature on so we wrote the majority of Ghosts of Our Past over the course of a couple days, sent it over to her and she really dug it. It became one of my favourite tracks on the album. This is one of the oldest songs on the album. Like many others on the album this one started from a really great loop Shane had been fooling around with. That loop of reverby “ah”s became the basis for the track. This song is about living in Vancouver and feeling the need to get away when it’s in heavy-rain season, which some might argue is all the time. I wrote this song after watching a movie called “Ruby Sparks”. It had such a great concept, for those not familiar it’s about an author who creates a character and she comes to life. The song was inspired by that movie. This track was written as a sort of alternate version/intro to Hollywood. We wanted it to have a sort of Bioshock/Old Hollywood feel to it. Hollywood was written about the perils of being an artist and the trials/failure one must go through. I decided to write it through the lens of an actor because it felt more interesting to me. When I was in San Francisco I was reading On the Road for the first time, which is by one of my favourite authors Jack Kerouac and he had this one quote that really stuck out to me “They came to be starlets; they ended up in drive-ins” and that later became the first line of the song. Face to face was sort of Frankensteined together with this one pre-chorus that we loved but could never get it to jive with anything. We finally were able to make it happen with this song. To me this song is the perfect blending of our more indie rock sound and our current exploration of more electronic elements. I rarely write love songs because I find it to be one of the most difficult things to write without being overly cheesy. I wrote this song about my girlfriend and her work as a flight attendant, which takes her away often. We’re usually on different time zones and that can make it hard to talk even when we live in a world with incredible communication devices so I miss her a lot. This is the oldest song on the album and was written back in 2013. I knew from the get-go that this would be the album’s closer. The song is about how people worship celebrities and obsess over them in films to the point where they feel like they know them, when the reality is they don’t.